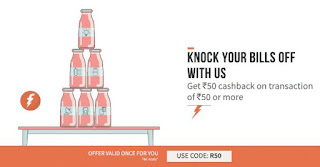 FreeCharge offering flat Rs 50 cashback on recharge or bill payment of Rs 50 or more. Hurry up and avail the offer if you are a lucky one to get the mail !! Only valid for those users who had got the mail regarding the offer!! How to get 100% cashback on freecharge? • Complete payment using Credit/Debit Card & Netbanking and Freecharge Balance. • Done!! 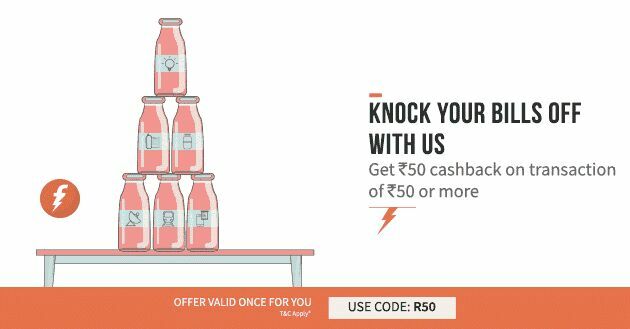 You will get flat 100% cashback (max upto Rs 50) in your Freecharge wallet. - Valid on successful Recharges / Bill Payments done till 12th October 2016. - Valid once per user/credit/debit card/mobile number. Ignore if promocode already redeemed. - Offer valid only on Freecharge App, Web & mWeb.